Smart home security brings a new dimension to protecting your family – whether you are at home or away. Reactive, proactive and a strong deterrent, smart home security is a world away from the traditional lock and alarm approach to home protection. With smart home security owners can stay in control of their property – even when they are on holiday, giving peace of mind on relaxing trips abroad. Home security can be a real concern for people leaving their home unattended for any length of time. The last thing a family wants to discover on their return is that their home has been broken into. Drawing the curtains, setting timers on lights and double-checking windows are locked are standard holiday preparations – but the telltale signs of an unoccupied home cannot easily be avoided. Smart home security not only provides a superior layer of protection for houses, it can also be controlled from afar using clever tricks to give the impression of there being someone at home – even when you are thousands of miles away with your feet up on the beach. CCTV cameras tailored to the layout of your property will allow you to keep an eye on your home inside and out. 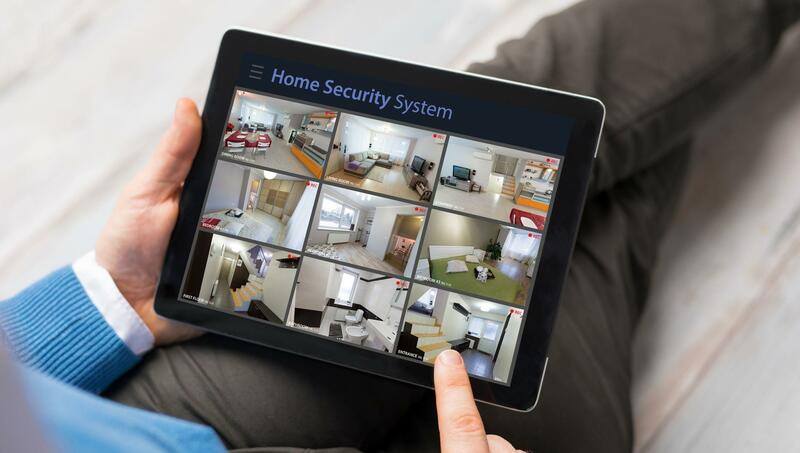 Focusing on specific areas of the home, smart home CCTV cameras allow you to scan the exterior of your property via remote access on your smart phone for any signs of an intruder or focus on particular areas of concern. Answer the door - on holiday! You can also keep an eye on who calls at your home. When someone rings the doorbell smart home technology allows homeowners to view callers and even talk to them remotely if they wish. Yes you can actually answer the door when you are in another country! But that is only the start of the wow factor that smart homes bring to keeping your home safe while you are enjoying your holiday. Blinds can be set to raise and lower on a timer giving the impression of life going on as usual and lights can be timed across the house – not just lamps using a plug socket. Should you be unfortunate enough so suffer a break-in or unwanted intruder, the smart home security system can kick in to reactive mode. Temperature changes and movement can be picked up by sensors and an alert sent to your phone notifying you that there has been a disturbance. The smart home system can activate the television or sound system come on and trigger lights across the house, making intruders believe there is someone in the home. And of course any culprits will be caught on crystal clear images thanks to the top-quality CCTV. Smart home security also helps to ease those last minute worries of ‘Have I locked the garage door?’ ‘Is the bedroom window open?’. When you’re sitting at the airport waiting to board a plane to whisk you away on holiday there is not a lot you can do to soothe these worries but hope you’re wrong. There is no need for that with smart home technology, the interactive system can flag up doors and windows that have been left unlocked and even give you the option to lock them remotely. A truly smart solution to home security. Don’t let concerns about the security of your home stop you enjoying your holiday to the full; choose smart home security to give you peace of mind with protection that you can control at the touch of a button – wherever you may be. Contact Avisio to find out how to upgrade your home security.